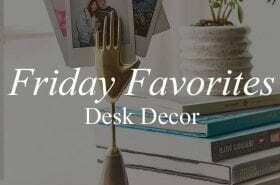 I haven’t done a Friday Favorites in such a long time; I thought I would share some of the staples I’m wishing for right now. These are by no means connected to each other, but they all are perfect for things that I are on my wishlist right now. 1. Jonathan Adler Metallic Zebra Dish. I’ve been buying a lot of jewelry lately (or at least more than I usually do) and I don’t really have a place to put any of my new bracelets or my old rings. I’d love this cute dish so that I could have easy access to all of my favorite pieces. 2. Rifle Paper Co. x Garance Dore Wall Calendar. If you are going to know one thing about me, it should be that I am a die-hard Rifle fan. This collaboration with one of my favorite bloggers Garance Doré is just so Parisian-chic. I’ve always wanted something from the collection and I need a 2016 calendar so this fits the bill. 3. Diptyque ‘Baies’ Scented Candle. This candle is insta-famous and raved about by almost everyone. I heard they smell amazing and I’ve seen the jars used as holders for anything and everything. 4. S’well Rose Gold Stainless Steel Water Bottle. About two months ago, I saw this water bottle and I swooned. ROSE GOLD EVERYTHING (it’s much more pink in person). I lost my first water bottle earlier in the school year and have yet to replace it. Everyone already has a Hyrdoflask, but I like the sleek design of S’well better. 5. ‘All In Good Taste’ by Kate Spade New York. I recently decided to add a New Year’s resolution mid-year: to read more. I have a few unread books on my bookshelf already but this little guide-to-everything would look great on a coffee table, if I had a coffee table.